These simple, tasty black-eyed peas are slow cooked to perfection with water and onions, and there's no need to pre-soak the peas. The peas are vegetarian, cooked without the addition of meat, but diced cooked bacon or ham may be added if you'd like. The peas are delicious served with hot boiled rice or add them to soups or greens. They make a fabulous meal with freshly baked cornbread and rice or greens; they're an essential part of a New Year's Day meal. They are said to symbolize coins while greens represent paper money. Eating the two on New Year's Day will supposedly bring luck and prosperity in the coming year. Rinse the black-eyed peas in a colander under cold running water. Pick them over and remove any damaged or malformed peas. Put the peas in the slow cooker along with the sliced onion and minced garlic. Add the freshly ground black pepper and the water. Cover the slow cooker and cook on low for about 5 to 6 hours (about 3 hours on high). Taste and add salt or a seasoned salt blend, as desired. Continue cooking for 15 to 20 minutes. Serve with hot baked cornbread, rice, and cooked greens. Peas and beans, for whatever reason, sometimes stay tough in the slow cooker. Many feel that salt and acidic ingredients slow the softening. 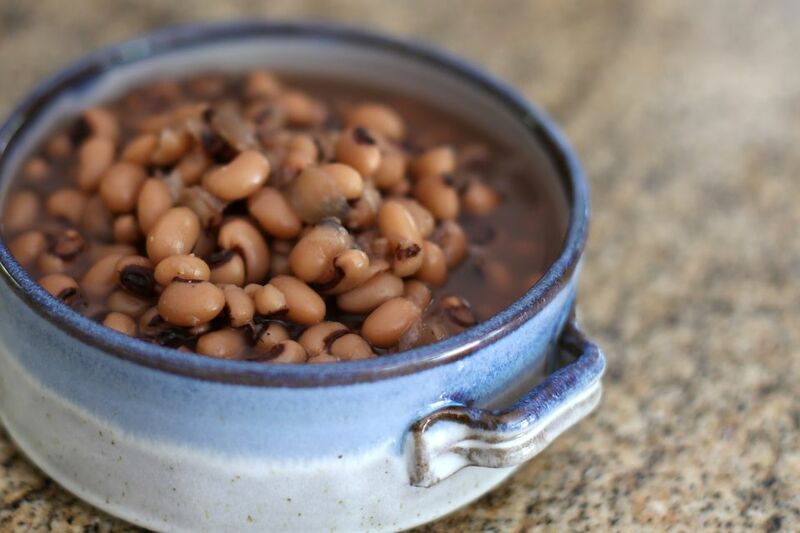 To ensure tender black-eyed peas, add the salt or a seasoned salt blend after they are tender and then continue cooking for 15 to 20 minutes. Add about 1 cup of chopped carrots and celery to the peas along with the sliced onions. Or add canned diced tomatoes when you add the salt. If desired, add diced cooked bacon, ham, or sausage to the peas when you add the salt.